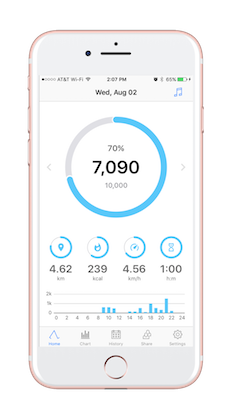 Accupedo is an accurate pedometer app that monitors your daily walking on the home screen of your phone. Intelligent 3D motion recognition algorithms are embedded to track only walking patterns by filtering and ejecting out non walking activities. 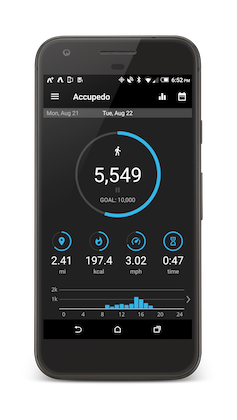 Accupedo counts your steps regardless of where you put your phone like your pocket, waist belt, or bag. 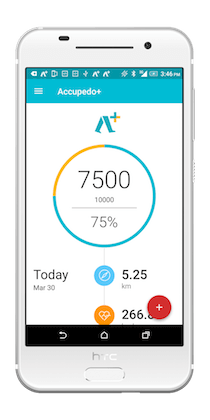 Be healthy by setting up your daily goal and accurately monitoring your steps with Accupedo. Enjoy walking with Accupedo towards a healthier you! - An Intelligent 3D motion recognition algorithm for accurate step detection. - GPS tracking activity with map: walking, running, and cycling. - Three step counting methods: Accupedo, built-in step counter, and Google Fit. - Daily notification and smart messaging. - Widgets on home screen. - Customizable display modes: steps, distance, minutes, calories, and Lap. - Charts: daily, weekly, monthly, and yearly step counts. - Daily log history: step counts, distance, calories burned, and step time. - Personalized settings: sensitivity, metric/english, stride length, body weight. - Share on SMS including Facebook and MyFitnessPal.